New potatoes are freshly harvested young, or small, potatoes. They have paper-thin skins and lots of moisture inside, and they tend to be sweeter than older potatoes (in much the same way that freshly picked corn is so much sweeter than cobs that have been sitting around for a few days). New potatoes are pure perfection in potato salads or simply boiled with a bit of butter and a few chopped herbs. Look for new potatoes in the spring and early summer. Look for new potatoes that have smooth, undamaged, and unblemished skins. The potatoes should be dry and feel firm. Avoid potatoes that have soft spots, bruising, or seem damp or wet. Skins that are starting to flake away from the potato are fine—that's the price of such youth and delicacy! New potatoes are freshly harvested, and a bit of dirt shows that they really are new potatoes and not just small potatoes. Because they have such thin skins and high moisture levels, new potatoes don't keep as well as more mature potatoes. 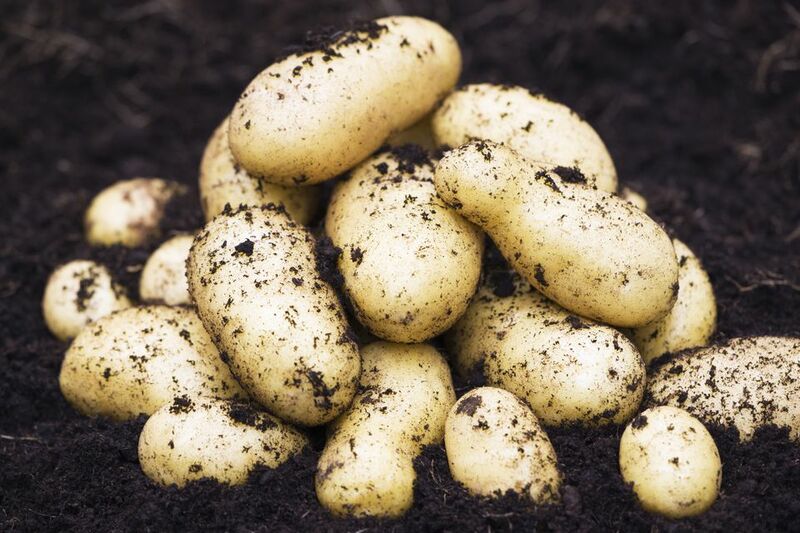 Keep them in a paper bag or loosely wrapped plastic in the fridge and use new potatoes within a few days of buying. Don't fall prey to the temptation to wash new potatoes before storing them. That bit of dirt clinging to their skins will help keep them fresh, and any water on the outside will hasten bruising and softening. Rinse any dirt off the new potatoes' skins and put them in a large pot. Cover the new potatoes with cool water and bring everything to a boil. Add enough salt to make the water taste a bit salty (this is how the potatoes get seasoned, so don't be stingy!). Cook, gently boiling, until the potatoes are fully tender, 10 to 15 minutes. Drain the potatoes, shaking off as much water as possible. Transfer the potatoes to a serving dish and top with pats of butter. Gently toss to melt the butter and coat the new potatoes simultaneously. Sprinkle with chopped parsley or other green herbs, if you like. New potatoes cooked this way are ideal alongside spring lamb or a simple roast chicken, with bright green spring asparagus, of course. Their high moisture content and slightly waxy texture help new potatoes keep their shape when they're cooked, making them ideal for potato salads like this classic American potato salad or this grilled potato salad. That same tendency to keep their shape means that new potatoes don't make great mashed potatoes, but you can use them to make yummy "smashed" potatoes. While not a traditional preparation, new potatoes can also be roasted. Put clean new potatoes in a roasting pan (they will roast up most evenly if they are in a single layer). Drizzle the potatoes with oil and toss to coat them, then sprinkle them with a bit of salt. Roast in a hot oven (anywhere from 350°F to 425°F) until tender and browning, 20 to 30 minutes. Cage-Free, Free-Range, Organic, Pastured... Which Egg Is Which?